Leaves from your favorite sycamore or Alocasia (elephant’s ear) plants can be preserved forever in castings for decoration in your home or garden. 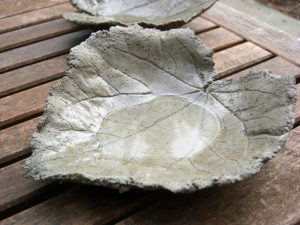 Leaf castings can even be used as bird feeders or bird baths! All it takes is a little know-how and a willingness to get your hands dirty. Instructor Rebecca Turk will walk you through the hands-on leaf casting process with each attendee making two leaf casts to take home. All materials will be provided. A 2-foot x 2-foot piece of plywood is needed to ensure the casts travel well, so please be sure there is room in your car. Your clothes will likely get dirty so dress accordingly. Join us on Friday, May 3, 2019 from 10AM-2PM for this artful class. The cost is $40 per person. Lunch is not provided, so please bring one with you. A refrigerator and microwave are available for use.